BRYAN EATON/Staff photo. 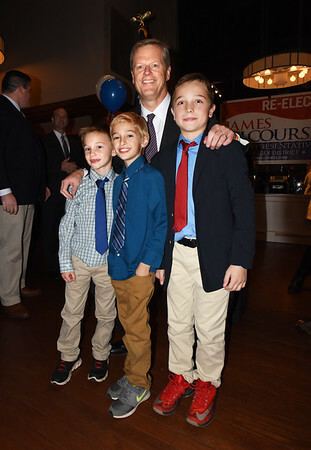 Governor Charlie Baker poses with youngsters, from left, Michael DeRosa, 8, Dylan McLatchey, 10, and Nicholas DeRosa, 10, all of Amesbury at the Mission Oak Grill on Wednesday night. He was in town attending a fundraiser for state Rep. Jim Kelcourse.